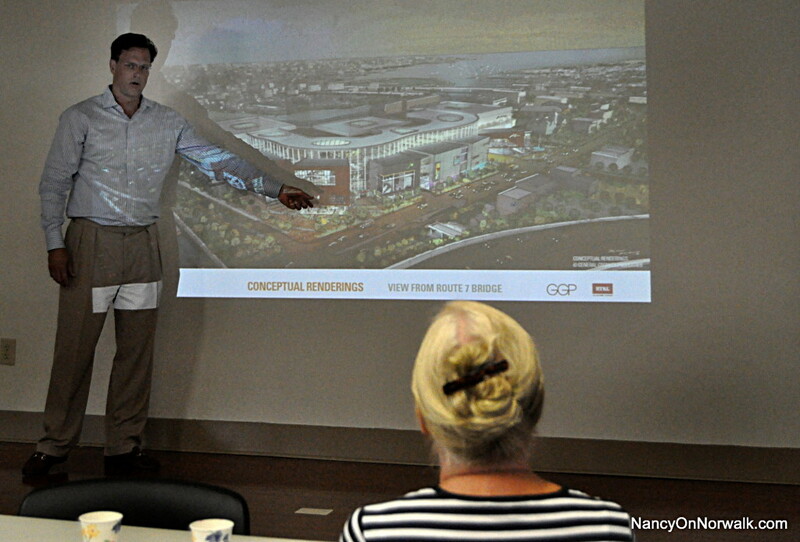 Doug Adams of General Growth Properties (GGP) explains the company’s mall concept Monday in the South Norwalk Library. NORWALK, Conn. – Sallie Marsico’s expertise about malls is admittedly dated, but she is bullish on the General Growth Properties (GGP) plan to put a mall in South Norwalk. Marsico was one of two people attending a GGP presentation at the South Norwalk Library, which was arranged to get feedback from the SoNo business community. Doug Adams of GGP said the crowd was better at last week’s presentation for SoNo business types, which was held in the evening. He speculated that perhaps his initial outreach had been effective enough that people didn’t have questions. A SoNo business person we caught up with in his shop said he didn’t make it Monday because he was working, though. He had been given a flyer but didn’t put the first meeting on his calendar, he said. He had no opinion on the mall concept because, he said, he had no information. Ollie O’Neill of O’Neill’s Pub did make it to the event. Adams and state Rep. Larry Cafero (R-137), GGP’s attorney, ran through their usual presentation: The site is smack dab in the middle of everything, Adams said — at the center point of the Route 7 connector, as well as along Interstate 95, and in the center of what should be a Norwalk business district. A well-designed mall would serve as a connector between SoNo and the Wall Street area, bringing life to what is now a dead spot, a “field of flowers for 20 years,” Cafero said. It’s a mixed-use district, they said: The first plan for Waypointe was 65,000 square feet of retail, but that has been scaled back to provide stores for people who live there. With the existing housing, there is still plenty of room for retail in the corridor, in accordance to the plans for the district. Cafero said there is a 27 percent vacancy rate for Fairfield County office space. As for what types of stores to expect, GGP is a real estate trust with a lot of connections, Cafero said. The entry point for shoppers would be fashion, Adams said. The stores would not be super luxury, but they wouldn’t be discount either, he said. It doesn’t need to have a lot of food or entertainment because the area around it has that, Adams said. There would be a fee for parking, which would complement the surrounding area, he said. O’Neill asked about overnight parking. Adams said that is a tricky issue – you don’t want people going to New York City for a few days and leaving the car at the mall, he said. “We might end up doing it where it just gets expensive,” Adams said. There will be no food court per se, but “fast casual” food would be offered, with no seating, Adams said. It’s possible that some of the street level stores would offer food, though. O’Neill asked about the mall’s hours. Adams said it would likely be open 9:30 or 10 a.m. on weekdays, and open at 9 a.m. on weekends. Experience shows that there would likely be 200 people walking the mall at 7 a.m., either to avoid snow in the winter or heat in the summer while they exercised, Adams said. It would close at 10 or 11 p.m. Stores on the street level, with entrances on the outside of the structure, might be open later, he said. “Typically it’s 10 to 10,” he said. Adams said GGP was surprised to learn there is nothing in the South Norwalk railroad station directing people to local businesses. There is no map showing where businesses are located – so GGP has made one. It will be delivered this week, Adams said. Marsico said she loves walking to Oyster Shell Park and that she hoped the mall would not disturb the serenity. Cafero said it would actually enhance the pedestrian experience. Deliveries would be in the far corner, next to the railroad tracks, in the back of the mall, he said. She asked about all the glass in the concept being marketed to the public. Adams said the glass opens onto open space, which would have kiosks in it. The curved front of the mall “isn’t inexpensive to build, but we thought has a lot of benefits,” Adams said. A skylight would be open to the lowest level of the parking garage, he said. “For us, it’s a relatively small, certainly compact center. We do feel that three levels is about all you can sustain, because that is where the anchors would be. We like the simplicity of the design,” Adams said. “Having been in the mall business for 25 years and been in every mall in the United States at one time, because I haven’t been in anything in the last 15 years so I am not an authority anymore, but it certainly has a much more interesting design than the General Growth Properties that I was very familiar with at one point,” Marsico said. Marsico, who said she was known as “Sallie Bird” at one point, said she once leased properties for Walden Books and 9 West. She is retired, she said. Adams told her there are only two malls currently under construction in the United States. He is a developer of the Staten Island Mall, which has a very different concept than what is appropriate to Norwalk, he said. There’s nothing around it, so there is no reason to connect it to the surrounding community, he said. GGP has added an exterior portion to its Providence Place mall, he said, to connect it to the statehouse. Its’ Oak Brook mall in Illinois was just remade, he said. “There is tons of area outside for people to explore things,” he said. GGP has spent a lot of time redoing older malls, he said. Norwalk is a unique opportunity in the mall business he said, as you can start with something new. GGP is very open to collaborating with the Maritime Aquarium and the Stepping Stones Museum for Children, he said. Stepping Stones has as much in storages as it has out on display, so there is plenty of opportunity for an interactive experience with the mall, he said. I love the notion that people are going to park here and go to NYC for a few days being a concern. If this place is such a draw, bringing in folks who would otherwise go to Westport, Stamford, Trumbull, then why would they need to go to NYC? I still say change the look all that bling does not fit in Norwalk, we live in NEW ENGLAND make it look & feel like it. But I do like the Mall idea. In what other city in CT would a mall presentation bring out just two listeners ? How embarrassing. Unless the “Norwalk Fix” is in and these are just “mall theatre” for an ignorant public. Real question is why the mall folks haven’t prepared a detailed written presentation of their project so that Norwalk citizens can learn what they’d like to do. Are we too dumb to read ? Or just irrelevant ? Does the pitchman speak for Norwalk ? How can anyone have any respect for City officials en masse for this farce ? So embarrassing. @srb, the change is a 27% vacancy rate for office space in Norwalk and the greater Norwalk area. There is NO demand for more office space here. Why don’t you get that? Do you think we need more “affordable” housing or more failing mom and pop stores that can’t survive in 2014? This mall is the best option now and in the long-term and everyone who has a child in Norwalk public schools should want this for the windfall of tax money that will fund computers and upgrades that are badly needed in our schools. If you want to continue to have a hole in the ground, feel free to write a $5 million dollar check to NPS to make up for what the kids would be getting for their schools. Taking a holistic view of downtown as smart planners do, what has changed over the years which makes a stronger argument for the mall is the completion or near completion within the next few years of well over 2500 new housing units within a 10 minute walk of the 95/7 site. Count them: Avalon:311, Wall St Place: 537, Waypointe: 460, Maritime Yards:198, Ironworks:108, The Pearl: 52, Washington Village mixed income project: 275, and potential Webster Lot/50 Washington (with a potential conversion from office only to live/work loft residential in the hulking 50 Wash., with a new glass skin and amazing views) that may total over 500 units. With thousands of new residents in mostly “mixed use” complexes already, do we really need yet another “mixed use” project at 95/7? As much as I love the concept of mixed use as a planner and landscape architect, it seems logical to now look at the entire downtown corridor as one whole interconnected mixed use system, placing the mall at the center next to the highway (minimizing traffic flow through the city), and becoming the main retail/entertainment component of a much bigger “mixed use” district in what is quickly becoming a fascinating and vibrant whole new downtown. That is why we should be talking about a trolley or rapid bus “connector” system real soon, and a system of bike lanes that our DPW is till struggling with as if we are not a real city. It’s coming, folks. And I could not be happier as a long time proponent of Norwalk who has watched the city for decades be “a city on the move” that hasn’t really moved much until now. We now need to concentrate on properly stewarding and managing this growth. We need Planning and Zoning Commission and staff members who understand smart planning concepts that reflect the staggering demographic shift back to cities that is happening everywhere. We need staff and commissioners who respect professional consultants who have national reputations and who are telling us what we need to be doing to plan for this growth, in the shelves full of studies gathering dust in the P and Z office (such as the 2011 Parking Master Plan that said we should have reduced our obsolete parking requirements city wide by 25% by 2014, which is now, to encourage small businesses and new smaller scale infill development, which is currently not economically feasible with current parking requirements that all other cities in CT have already reduced. ) Why hasn’t that happened yet? If we don’t fix our dysfunctional planning process soon, we simply will not be prepared for the explosive growth that is coming, and we will lose control over planning the future of our once great city. Perhaps Larry Cafero, representing GGP, can have a long talk with P and Z staff about why that department is ignoring almost all of the professional studies that taxpayers have paid for over the years, including implementing the Parking Master Plan, the TOD study for SoNo, and the Westport-North-Main Study to protect neighborhoods like Silvermine and Cranbury from overflow traffic from explosive big box growth in the Main Ave corridor. If enough developers with enough money and clout behind them point out what is wrong with our P and Z Department and our dysfunctional planning process now, perhaps we can get things fixed and have a new mall plan that actually works for everyone, including the local business community and protecting existing neighborhoods from unplanned growth across the city. Let’s not forget how West Norwalk was negatively impacted with speeding traffic taking short cuts from New Canaan and Westchester by the poorly planned CT Ave big box explosion in the 90’s. Let’s not repeat our major planning blunders again. That said, the mall next to the highway ramps at 95/7 is not a planning blunder as some have stated, but is beginning to look like it just may work if designed well (and if the state subsidies to Norwalk are generous enough), but also only if the rest of the city is planned better than it is now to limit retail sprawl such as on Main Ave. where the roads and neighborhoods clearly can’t handle the traffic, and encourage more density downtown near transit hubs with reduced parking requirements and implementing the SoNo TOD zoning overlay that are both now 2 to 3 years overdue. What’s the holdup? Perhaps Mr Cafero can find out for us, as I have had quite a time over the years figuring out why our P and Z staff is so stubborn to change anything while ignoring all the professional planners’ recommendations in millions of dollars of studies we have all paid for. It just makes no sense anymore, and needs to be fixed. I’m with Mike, we need a trolley to tie this all together. From the train station, through SoNo, on to the mall…great idea!!! What tax revenue? They are getting abatement for years on this project. As for the shuttle/circulator, somebody should go see what goes on at the Stamford Train station with their shuttle parade before they advocate this. If it is not well-managed, free, and frequent, it will not solve the problem it is intended to solve. So Mike gives me a massive headache when he responds with his infamous 350 page letter response, however…. I agree with him. What I also feel that is most important is to BEG Amtrak to stop in South Norwalk, which will cause an explosion of growth. Developers would buy up all the houses around the train station and put up office building, etc … it would truly change Norwalk as we know it. Maybe the hotshots would speak with Amtrak? i am excited about all the interesting development brewing. A holistic view is needed as mike points out. tying together the sono and wall street areas would really enhance the livability of the city. bike paths and pedestrian ways are needed. i’m not sure how there could be too much mixed use though… i guess it depends on the mix. part of what is so appealing about the sono/wall st parts of norwalk is that they seem like parts of a city that grew and evolved naturally. the ironworks and waypoint don’t look or feel out of place. Sure, there are benefits to a mall but i cant imagine it won’t create a bottleneck that will significantly detract from the areas usability and livability. there is rush hour type traffic every saturday with crowds heading to the big boxes at exit 14. i-95 and getting on/off is a nightmare now. The Hour says 20,000 people go the the norwalk boat show over 3 days each fall. The off ramp at exit 16 is backed up onto the bridge and causes back ups on top of the exit 14 back ups. If the mall gets 1,000,000 per month (GGPs number) how many people will go on a typical saturday?? 100,000?? Sure, the sono off ramps may be better than exit 16, but 10 times the traffic would surely create a nightmare at 957. getting from wall st to sono would be an exercise in frustration. The tying together of the city would be hampered by a big knot in the middle. the existing delays on 95 would only be worse. what about the rt 7 southbound?? GGP says 5% of the mall traffic would go beyond the mall. In other words, 95% of all mall goers would only go to the mall. spend their money in mostly corporate owned stores, not locally owned (don’t tell me they won’t be chain stores, all malls are filled with them), congest norwalks roads and go home. The profits from the mall AND stores would leave norwalk and go the the corporate owners elsewhere. Sure we need to do something with the property. The taxes would be great, but don’t think in terms of mall taxes vs. nothing, its mall taxes vs. other development taxes. there could be something better. maybe we need more retail, less apartments, less office… maybe. i don’t know, but a mall would be so radically out of character for the city of norwalk. lets face it, ct ave and the big boxes are there. they serve their purpose, but please, lets not allow a similar destruction of the city character happen in sono. Shuttle minibuses work beautifully all over the world when they run frequently and serve plenty of minor routes. I know why Norwalk has gigantic buses: it was federal money, and only given on the condition that we got huge buses instead of the vastly more practical minibuses. It is so annoying to see these huge buses driving around with 1 or 2 passengers. Maybe the mall is an opportunity to undo the wrongheaded thinking and implement a system of minibuses that people will actually use. Oh, and can we get GGP to make a nice generous donation to enable us to resurrect the Norwalk Museum? What “other options” are these opponents talking about? There has been a hole in the ground for 15 years. No one but a mall developer wants the space with 27% office vacancy rate and no mom and pops are opening up stores in this Dan Malloy economy. I maintain that a whole in the ground is better than a failed mall. We can do better than this, but we have to make up our minds what we want to do and go and get what we want. Nobody ever walks in off the street and offers you what you want. They offer what they want you to buy. I’m surprised that I haven’t seen any comments from anyone who lives at the Maritime Yards which is just a stones throw away. This seems odd judging from the outcry of protest from neighbors near the proposed B J’s site. Do these people know what’s going on? Funny you should post this. Nancy and I were driving by the site today and I broke into a bit of Schtick about “building a mall next door and how I didn’t sign up for that.” I heard this in Boston from Logsn Airport neighbors and Hyannis from Melody Tent neighbors. (Who bought condos across the street and, for 10 weeks ever summer, dealt with awful traffic and loud music. But the tent was there first… A mall in my back yard? Silence? Wassup with that? Mark and Kevin, perhaps you are underestimating the human desire to shop. Ever take a cruise to the Caribbean? Most folks get off the ship to shop. I tended to join the odd curious bunch that wanted to go see the historic sites and jungles and pristine beaches, but it was eye opening how most Americans just like to shop. In my discussions around town with friends, when the conversation turns towards the mall, a lot of folks who I least expected admitted that they would love a nice place to shop. You don’t even have to buy anything. More than once I went to the Norwalk Boat Show and pretended I loved the 5 million dollar Italian yachts, just to walk off the boat thanking the salesman saying the Armani-designed bathroom was just too small. Sometimes it’s just fun to look. Shopping is a game and lots of folks like to play it, even though I hate shopping myself and get all my clothes at Old Navy. (A drag queen I once knew always said its not what you wear, its how you wear it. And always have an attitude. It works for me.) Shopping is obviously a popular entertainment in and of itself. I am still not convinced the mall is the best use of this site, but comments like yours that a mall is somehow a bad thing just because its a mall do make me think that there are some purely emotional associations at work here, perhaps from the 70’s when malls surrounded by acres of parking lots were both worshipped and reviled in that era of dysfunctional suburban sprawl. I am trying to keep an open mind here in the best interest of Norwalk’s future, but I see both sides of the issue too. In successful cities, its the stores and restaurants that draw the crowds and help create a sense of “place” . Where are Norwalk’s stores? I hope no one tells me its just the generic big boxes, as much as we do like their convenience. We are better than that, and why not shoot for the best for a change? A drag queen I once knew insisted to me over and over that it was just a character he was playing in clubs, but then we met him for dinner and, as the ad said, Don Auxier IS Honey West. But I digress. Fact is, I have cruised to the Caribbean (part of my old gig as a travel editor and ship reviewer) countless times and, yes, the urge for the masses to shop is frightening. They are whipped into a frenzy by on board port lecturers who spend their time hyping various shops, all of which give the cruise lines kickbacks. It was not my intent to say “mall bad, bombsite good.” I am still straddling the issue, and hoping not to lose my footing. My point was more about people who go to bed one day with a quiet, if ugly, field in their back yard, and wake up to a chrome-and-glass palace bustling with Old Navy shoppers. But, hey, if you want solitude, don’t live in a city. And for the record, I despise shopping, avoid malls (even when I could still walk well) and take full advantage of Amazon (I am eagerly awaiting the arrival of delivery drones!). And I probably spent about $22 total in port shops on more than three dozen cruises. GGP, could you please bring a Disney Store and a Nordstrom’s to Norwalk? It’s a wonderful embrace of the ordinary, the mundane, the Anywhere USA concept. I am nearly resigned to the fact that that is all Norwalk really wants. I will be interested to see what all of these stores that one can find everywhere and anywhere in this country (except, perhaps, the middle of Wyoming or North Dakota or something but I digress), will be doing in twenty years. Or, what the stores that already exist in Norwalk and neighboring communities that take up residence in this glassed in big box will look like, if not empty. Because, if this mall represents competition to those stores, one can depend upon the demographic of a successful neighborhood with those same stores in them now to go down hill later. So, instead of just boarded up fronts in SoNo, we can look forward to them being all over town. Larry Cafero and GGP once again paint a bucolic picture of what could be in a perfect world: A mall that would unite Sono and South Norwalk with Norwalk proper in a cultural axis extending from the Belden post office area down to the South Norwalk railroad station. The focal point will be “The Mall” complete with jewel box windows to attract shop-a-holics from all of Fairfield County and beyond. This corridor would be complemented by jitneys to carry the expected million/year visitors from cultural spot “A” to fun spot”B”, bike routes for the more adventurous, water taxis, safe sidewalks to allow strolling shoppers to enjoy the walk from the MLK train station, through the traffic clover leaf up to the mall, and the mall itself would include places for teenagers to congregate and lunchtime customers for the sandwich shops. It’s a wonderful concept—for another time and place. No one has asked who would pay for all those “complements” to the proposed mall. I suspect it would be you and me as taxpayers. Rod, id much rather pay for that than another affordable housing project or SoNoCC/Neon head’s $150,000 salary, wouldn’t you? Love the trolley idea. Stamford launched one that runs from Harbor Point to UConn and around the downtown area. It’s free (subsidized by BLT with a grant, I think but don’t hold me to that). I’ve used it rather than driving my car during lunch hour. They even have a “live tracker” so you can pinpoint when it will be at your stop. I would love something like that in Norwalk, linking the two train stations would be awesome as the Danbury line doesn’t have the best of schedules and will give access to the restaurants and hotels on Main/Route 7 area.